While we are a Catholic school, we recognize not all families are Catholic. We warmly welcome all those committed to faith formation in the spirit of Jesus Christ! Students learn the foundational tenets of Christianity through play and interactions with teachers, staff and their peers. Because we are a Christ-centered school, there is a positive, accepting social environment and culture at St. John’s, so bullying is rare. The faith formation program at St. John's is comprehensive, woven through every aspect of a child’s time with us. Each day begins with morning assembly where we read the Gospel, offer prayer intentions, and make school announcements. Every 1st Sunday of the month, we celebrate a special, family-focused school parish Mass at 10:00 a.m. in our church. Each Wednesday, we celebrate Mass as a school community. In fact, we are one of the few Diocesan schools to celebrate a weekly Mass that includes our entire student body. 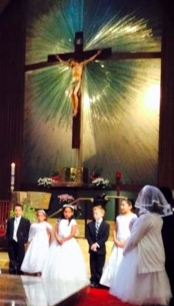 Students participate as cantors, altar servers and lectors. They also read prayer intentions and participate in the orchestra. You will frequently see many of our parents, relatives and members of the parish community in attendance, as all are always welcome to join us for morning assembly and Mass! All St. John the Baptist students take Religion as a subject, not only to learn about our Catholic faith, but to understand how we are called to live out our faith. Our students put faith into action in many ways. For example, they participate in our Living Stations of the Cross to reflect on the great sacrifice of Jesus Christ during Holy Week. We also honor and pray for the departed when we recognize All Souls’ Day at our Table of Remembrance. May Crowning is a beautiful dedication honoring our heavenly Mother during the month dedicated to the Virgin Mary. We also enjoy regular "Faith Family" school experiences. These experiences enable students to interact with different grade levels, to connect and grow in faith and knowledge as a school community. Sacramental preparation is a critical part of our students’ experience at St. John’s. In 2nd Grade, we prepare students for the Sacraments of 1st Communion and 1st Reconciliation for those families wishing to continue and support their child’s ongoing faith journey. Likewise, students in 7th grade have the opportunity to prepare for and receive the gifts of the Holy Spirit through Confirmation.